My name is Tsatia, and I am currently a third year student here, and I am pursuing a double major in both Communications and First Nations Studies. I moved here from a little town in northern BC, a town called Smithers, which is about 4 hours north of Prince George BC. I am eager to get involved in the academic community and become a voice for First Nations people in this new and modern era of information distribution. I have never written a blog before, as I’ve always been rather intimidated by the idea of putting my thoughts and my feelings on the internet. However, now that I’ve begun to form an opinion and experience more cultural events and dialogue, I think that it is important for me as a cultural and spiritual person to begin to distribute my ideas on a wider scale. I have always enjoyed writing, but usually I write on more of a leisurely basis, and switching to a more public and academic sphere is something entirely new to me. I hope that through my experiences that I write about, I can bring a new aspect of cultural understanding and appreciation to those who are interested in reading what I have to say. 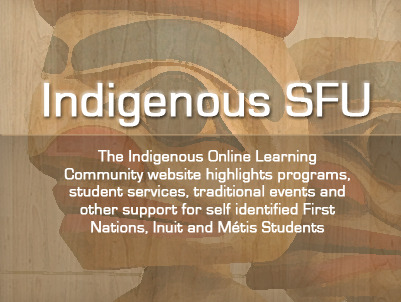 I am also currently one of the Indigenous Ambassadors for SFU, working with SFU Recruitment to bring more cultural awareness and recognition to both prospective students on campus, and to younger high school students who are curious about what SFU has to offer in way of Aboriginal culture. Last year, one of our main projects was to increase the inclusion of Aboriginal cultural to the campus tours that are offered by the SFU Student Central in Maggie Benson Centre, as there were many aspects of Indigenous culture that were being excluded from the tours. This year, working alongside Angela Semple and Yusuf Varachia, we hope to broaden our spectrum of influence directly into the high schools and elementary schools of the lower mainland and the indigenous students that are preparing for a post-secondary academic experience. In addition, I have also recently become a board member on the Simon Fraser Public Interest Research Group, and have become very active in the organization around the decolonization and cultural liberty of the First Nations people. Alongside other board members, we are currently working on reviving the Antithesis magazine that was published in previous years. This is a very exciting opportunity for SFPIRG, and I am looking forward to bringing this back to life, and will hopefully be including more updates on it here, in the future. For me, my university experience has been a wide variety of all life experiences, and in the three years that I have been a student at SFU, I feel like I have finally found the reason that I came to university. I knew that I wanted to major in Communication for over a year now, but I never really understood my calling to the media and the journalistic perspective of it. I have always been an avid writer, and interested in the different mediums that are used for communication, but I never had a specific direction that I wanted to take this interest in. However, in the past 6 months, I have finally come to understand why. Through both the media, as well as personal experiences, I have found that there is a distinct lack of communication between Indigenous people and the mainstream media, and this creates a lot of racism and misunderstanding of both culture and events that take place in both a cultural and western context. I would like to work towards creating a society that not only respects Aboriginal culture, but also understands and appreciates it in a wider context and way of life. There are so many things that the Indigenous people of Canada have to offer, and if more people had open hearts and open minds to the ways of life that they represent, I think that Canada would become a much more peaceful country. This is what I am working towards, and hope to lay the groundwork to achieve this one day, as I’m unsure if I’ll be able to achieve this dream in my lifetime. In conclusion, right now, I am excited to add my voice to the other cultural and enlightened voices that contribute here to the OLC. I hope that what I have to say will be as important to other people here as it is to me, and I look forward to sharing my thoughts and cultural experiences here in an academic setting. I welcome any feedback and constructive criticism that readers and other contributors have for me, as this is a new learning experience for me. However, I hope to bring a fresh voice to this community, and to increase cultural awareness of indigenous events that matter to me and my colleagues.